Frisco, Tex. – Dallas Stars General Manager Joe Nieuwendyk announced today that the NHL club has acquired defenseman Alex Goligoski from the Pittsburgh Penguins in exchange for left wing James Neal and defenseman Matt Niskanen. 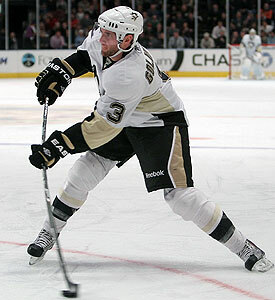 Goligoski, 25, has appeared in 60 games for Pittsburgh this season, scoring nine goals and 22 assists for 31 points. Averaging 20:45 minutes of playing time per game, he shares the Pittsburgh lead for plus/minus rating (also Sidney Crosby) with a +20, and has a +34 rating for his career. Goligoski leads the Penguins in game-winning goals this season with four. A native of Grand Rapids, Minn., he was Pittsburgh’s second round selection (61st overall) at the 2004 NHL Entry Draft. A member of Pittsburgh’s 2009 Stanley Cup Championship team, Goligoski tied a career-high earlier this season with a seven-game point streak (3g, 4a) from Oct. 7-18. He played three seasons at the University of Minnesota (2004-07), scoring 25 goals and 73 assists for 98 points in 117 games. The 5-11, 180-pound defenseman was named First-Team All-American, First-Team All-WCHA, and WCHA Defensive Player of the Year as a junior in 2006-07. Neal, 23, was Dallas’ second round selection (33rd overall) in the 2005 NHL Entry Draft. He has appeared in 59 games for the Stars this season, scoring 21 goals and 18 assists for 39 points. Niskanen, 24, has appeared in 45 games for Dallas this season, recording six assists with 30 penalty minutes. He was Dallas’ first round pick (28th overall) in the 2005 NHL Entry Draft. The Stars will host the New Jersey Devils on Tuesday at American Airlines Center (7:30 pm CST, TV: VERSUS, Radio: Sports Radio 1310 The Ticket).